Why should we read BOUND? BOUND is for those who enjoyed Florian’s company in GUARDED. His easy manner makes him the glue that holds the Silverton group together, but he was a mystery that needed unravelling. What should we expect from BOUND? BOUND is a different type of urban fantasy than GUARDED, but as before, you can expect fight scenes, a salvo of humor hits, and, of course, a handful of steamy scenes, plus plenty of plot. So fans of GUARDED are going to love it? I hope so. Florian is a different kind of hero. Even though he doesn’t have the pages dripping with testosterone, his strength is never in doubt. One reader described him as the thinking-woman’s book boyfriend, which made me very happy. 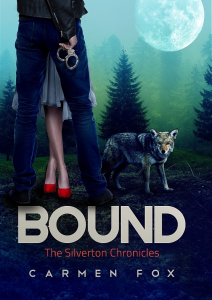 If you’re into character-driven plots, BOUND should hit your sweet spot. Do you have to read GUARDED to understand BOUND? If you’ve read GUARDED, you’ll have no trouble jumping straight in. If you haven’t, it shouldn’t take you long to figure out who’s who. Basically, it’s a standalone. References to past events are kept short and only introduced where absolutely necessary. This is book 2 in a five-part series. What’s next?